Producers understand how much nutrients a crop needs to grow a bushel of grain, says Solberg, a well-known crop whisperer (agrology expert) from Earth Jigsaw in Devon, Alberta, who provided some of the technical crop expertise to develop the app. But it also takes 67,000 pounds of water to grow a bushel of canola. But for most farmers, water availability remains a fundamental unknown of the equation in dryland agriculture. This leaves them guessing about how much nutrients they should apply at the start of the season. No one wants to throw money away by applying too much if it turns out to be a drier-thanexpected year. On the other hand, no one wants to lose yield by not using enough for growing conditions, either. 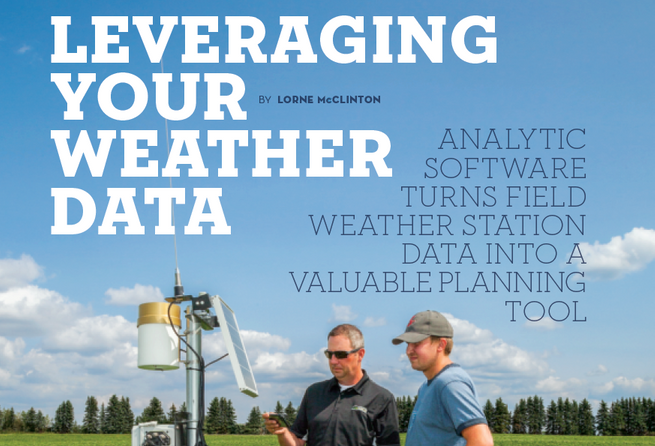 The app addresses this quandary by using an algorithm that combines long-term weather information from the area with data collected from automated field weather stations, equipped with soil moisture probes, to determine the crop’s water-driven yield potential. It can predict whether there is enough there so a farmer can justify top dressing additional fertilizer up to three months in advance. The app is about 80 percent accurate at the field level and up to 90 percent near to the probe, Solberg says. It’s not only close enough to get you into the ball park, it’s accurate enough to get you into the ‘P for profit’ section too. He expects that once more weather stations are out there, and the algorithm becomes more refined, it’ll get you into your row and seat number too. The app is designed to work with a weather station equipped with a rain gauge and a 100-centimeter (cm) moisture probe, Kessler says. The probe uses five sensors to measure soil moisture and record the root absorption at 10, 20, 30, 50, and 100 cms. The sensors show exactly where the crop is pulling moisture from every single day. Some also monitor wind speed, humidity, soil temperature, and the leaf wetness too. Tyler Buba installed his first stations on his mixed grain, seed potato, and beef operation at Spruce Grove, Alberta, in 2018. While he still views himself as a rookie with the app, he said it provided immediate help by taking the guesswork out of fungicide application decisions. More information on the app can be found at cropintel.ca.